The Alpine Club installed a meteorological station on a ridge near the summit of Denali at an altitude of 5710 m in 1990. 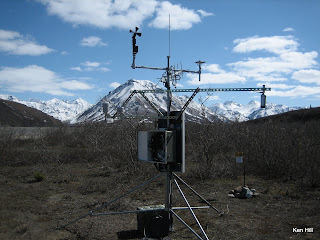 In 1998, this weather station was donated to the International Arctic Research Center at the University of Alaska Fairbanks. In June 2002, a weather station was placed at the 19,000-foot (5,800 m) level. This weather station was designed to transmit data in real-time for use by the climbing public and the science community. Since its establishment, annual upgrades to the equipment have been performed with instrumentation custom built for the extreme weather and altitude conditions. 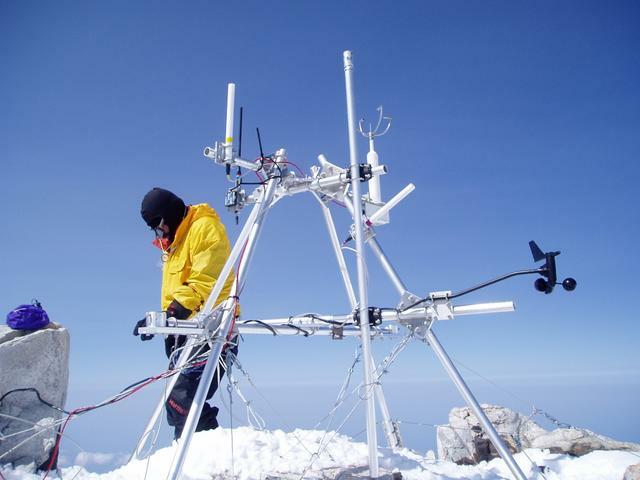 This weather station is one of only two weather stations in the world located above 18,000 feet (5,500 m). The weather station recorded temperatures as low as −75.5 °F (−59.7 °C) on December 1, 2003. On the previous day, November 30, 2003, a temperature of −74.4 °F (−59.1 °C) combined with a wind speed of 18.4 miles per hour to produce a North American record windchill of −118.1 °F (−83.4 °C). Even in July, temperatures as low as −22.9 °F (−30.5 °C) and windchills as low as −59.2 °F (−50.7 °C) have been recorded by this weather station.